A suite of calibration antennas used in Green Bank to measure atmosphere and manmade sources of radio interference. The radio signals we pick up from objects in the Universe are a billionth of a billionth the strength of a cellphone signal. This is one of the reasons why our telescopes are so very large. However, a large collecting area is not enough to make good interpretations of these data. Astronomers need to know how much of their astronomical data has been contaminated by radio waves given off by air molecules, the telescope’s own electronics, and other sources of interference. When the Green Bank, West Virginia site was first purchased in 1957, large telescopes were still being planned, and the first would not come into operation until 1959. The handful of astronomers on staff worked with the engineers and machinists to construct calibration antennas to measure the site’s atmospheric and manmade radio environments. These investigations would help astronomers and engineers design and plan for the most efficient receivers best suited to the large telescopes that now dominate the Green Bank site. Frank Drake built a corner reflector interferometer from surplus telephone poles and wire mesh. This antenna had three planes of mesh joined at 90 degrees to each other to form a pyramid-like corner in the center. When aimed at a source (for Drake, it was Jupiter), the radio waves hit one side, bounced 90 degrees to the other side, and then bounced 90 degrees to come right back out to a receiver. Drake’s radio measurements for Jupiter were consistent with those from more sophisticated antennas, and he soon abandoned the device; however, his corner reflector interferometer helped him discover a high level of radio interference from vehicles and other electronics that the Observatory would need to tackle. In 1958, before new receivers were used on the 85-foot Tatel Telescope, they were tested on a scaled-down 12-foot dish antenna. This little telescope had its own 9-foot square control building a few acres away from the Tatel. After a period of testing and acceptance on the 12-foot, a new receiver would graduate for use on the Tatel. 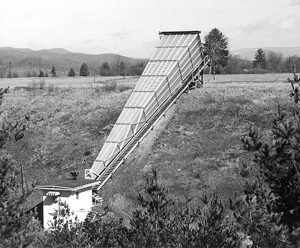 By 1962, the 12-foot test telescope was repurposed to try a new method of radio astronomy called millimeter-wave astronomy. Calibration Horn Antenna, affectionately known as “Little Big Horn,” worked tirelessly in Green Bank, West Virginia monitoring Cas A. A Calibration Horn Antenna, nicknamed the “Little Big Horn,” was built by John Findlay in Green Bank in 1959 at the same time that our first large telescope, the 85-foot dish Tatel, came online. As its name implies, the 120-foot long horn antenna was used to gather data that could be used to compare with observations made by the big dish telescopes. In particular, this horn measured the intensity of radio waves coming from the sky’s strongest non-solar radio source, Cassiopeia A. The Calibration Horn was built on a 30-degree hillside in order for it to aim at this source as it rose up the sky. For 50 minutes every day, radio waves from Cas A would pour into the 13-foot x 17.5-foot opening of this horn and be tapered to the 3-inch x 6-inch feed to enter the L-band (21-cm wavelength tuned) receiver. A chart recorder kept record of the quality of the signal. The Calibration Horn measured a total power output for Cas A, and thus provided astronomers with a standard reference point on the sky against which they could measure other hydrogen sources. A 4-foot parabolic horn reflector antenna, which received radiation on a wavelength of 3 cm, stuck out of the side of the Nutbin, research lab. It was called the “Sugar Scoop,” and it helped astronomers gather information about man-made radio interference on the site. 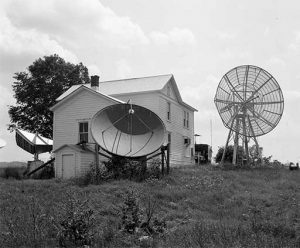 In 1961, a 20-foot parabolic antenna was installed at the Beard House, an existing farmhouse that served as our first office and laboratory on site in Green Bank. It was used to study 6-cm radio waves coming from water in the atmosphere, vapor clouds, and rain. The results of these investigations influenced the choice of suitable receiver frequencies for the 300-foot and 140-foot telescopes that were being built at the time.